Authentic Vintage Boat Hat. We Are Remaking Them! 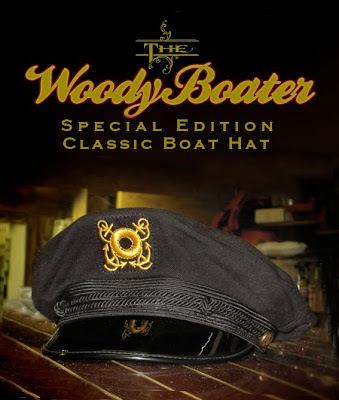 Woody Boater is proud to announce that we are underway to remaking high quality Authentic Yacht, boater caps. The feedback from the eBay find was mixed. “I wouldn’t be caught dead in that thing” vs, “I have been looking for one of these for 5 years. I want 2”, pretty much sums up the feedback. It’s a love hate thing. But for those of us that are in the love category, I am marching forward. I have secured the original manufacturer in California, that is still in business, and was the provider to many of the Hollywood movies and stars. This is not the crap that you get online for 5 bucks.. This is the real deal! This is the one. The subtle differences are in the details. A patch vs just embroidery on the hat, the 100% wool material, Brass buttons, and the rope around the bill. They are made to size one at a time just like back in the day. And yes they still have all the material, and some left over patches. So we are off to LA in a week to visit the factory. I will of course report from there with images and more details…You can order these in any color you want. As long as its black or white. We will also be working on some other options in the future, like a flat leather bill, kacki and other color wool, perhaps a crusher style…. and new baseball cap versions coming up. All very cool stuff. So… if you want one, they are $135.00 each, will take 6 weeks to make and I will need your head size yes even fat head size .. like me are available… They will be made just for us in this edition. I need 12 or more orders to move forward, currently we are at 6… So speak up. Time Stands Still In A Classic Boat! Count me in for one thanks Matt. I presume you'll take details later? It's been decades since I've had to deal with hat size. How is the head measured for that these days? I suppose fine mens stores sell hats in sizes, could go to one of them and try on hats, make note of the size I need and then just say "thanks but no thanks" and leave. Is there an easier, more suttle way? I suppose if I'm going to be cruising around in a boat named "Woody Boat" I had better add my name to the order list. I would look out of place without the official WoodyBoater hat covering my hairless head otherwise. I wonder if Matt will insist that we submit photos of ourselves wearing our new hats for purposes of modeling to other prospective customers? Yikes! Appriciate all your hard work on this but I think I will stick with the straw cowboy hat! On the up side though, put me down for 3-4 t-shirts (or polo's!) when those come around! I would like the kacki and leather bill version. Mike.. I will look into the kacki deal this early. I need to see if we can customize in a bulk order. I thik I can.. But will check. You all can email me with specifics. Just make the subject Hat size. I wont be taking any money til we are ready to move ahead with the order. I will do that in LA on the 6th or so of january. I was wondering if you can point me in the right direction. I am looking for that flooring that looks like decking on vinyl-Nautilux? You might want to check out the boat buzz forum. It's on one of the wood planks on the lower right side of the web site. I know there was just this topic talked about. It all depends on the type boat you have as well to make sure it the correct style and color…. Count me in [email protected] love to have the hat….when do you need the $$ and the size? Here is the Hat update. We are about there. I just spoke with the supplier. I will be in LA on tuesday to make the deal happen. Will do a story to update. One big thing to note is that they will all be black wool. Not white. Or if everyone wants white. Speak up. They all have to be one way to make it work. Please email me at [email protected] and let me know. I also need hat size. They are NOT self sizing. Please, let me know when you are ready…www.bayviewminocqua.com – interested in four hats…launch boat tours.